A Wild 2D Artist has Appeared! My name is Richelle Rueda. I am the most recent addition to the team here. While I am new to the studio, I have spent a number of years as a freelance 2D artist and illustrator under the pen name FireCatRich. I have a background in fine art but my love of video games has drawn me to studio life. A serendipitous meeting led me to SHG Studios and landed me in the growing browser game team. While the core gameplay for Spy Battle has not been altered there have been some radical visual changes to bring it more in line with the visual goals set by SHG’s other browser game, Star Pirates. The first major question that arose focused on a primary workflow of the game. 2D or not 2D? While the game is entirely 2D, the majority if not all of the images were produced using 3D models. While the models have served well in the past, Spy Battle’s new look was aiming higher. My on boarding was a combination of familiarizing myself with the current state of the browser games, finding the of goals for these projects, and getting down to business making an ever growing stack of icons, UI elements, backgrounds, and characters illustrations. This process started in earnest in early December and is currently ongoing. Spy Battle has a rich lore and a long player history but the game up to this point has left much of its world in words. There was opportunity abound for robots, cyborgs, humans, monsters, and everything in between. One of the first on the list of required characters was a new look for an AI robot. Ideally it was something that an individual could have and a spy would often want something that was rather innocuous, at least in appearance. 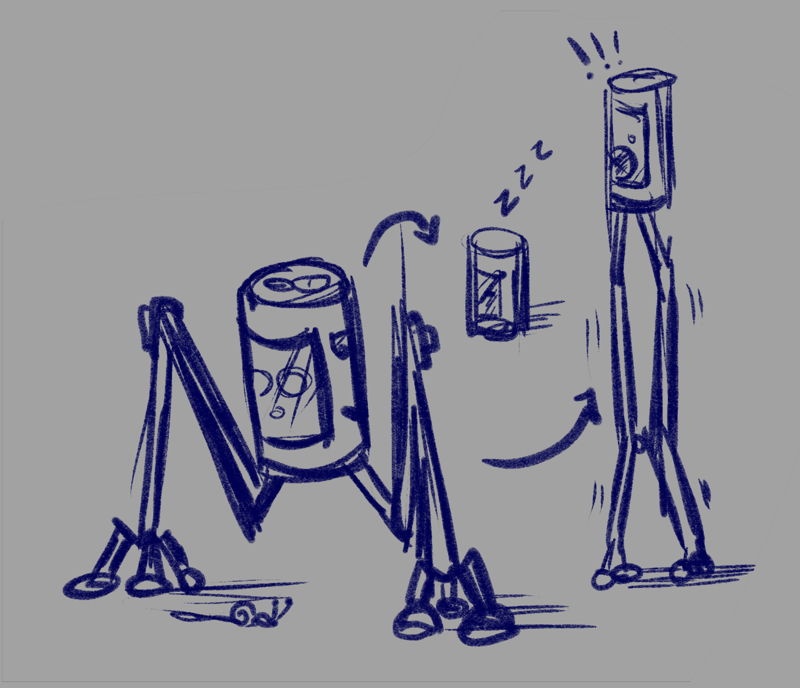 Out of a dozen or so sketches rose the soda-can robot. Long stork-like legs and a little can body would be the new greeter for players. 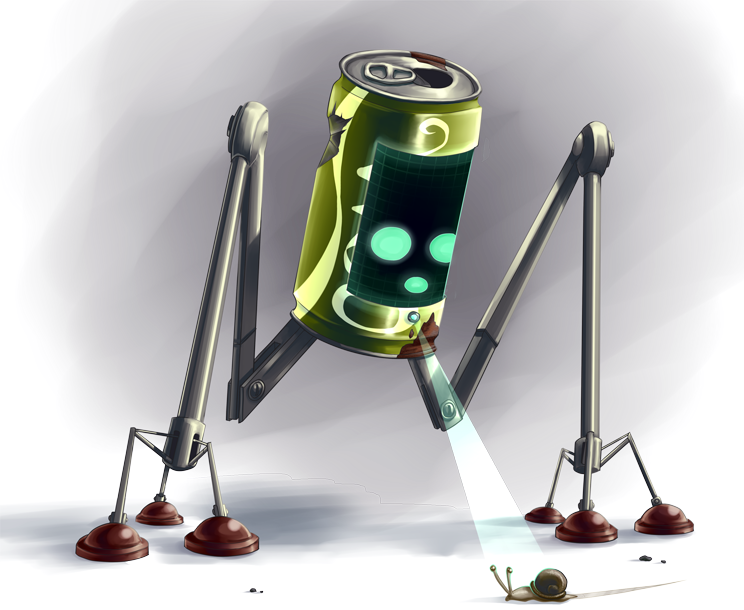 Much like Spy Battle the game, the little can looks to have history with his little dents and rusted patches but there is a shiny glow within.